Here are four starlets from 1941 wishing you a Happy Halloween, posted by Film Noir Photos. From left to right: Barbara Britton, Ella Neal, Eva Gabor and Katherine Booth. This morning 's Sunrise Serenade was "Small Fry" by Bing Crosby accompanied by Tommy Dorsey and His Orchestra. Click on the song title to listen courtesy of Jazz On Line. In preparation for All Hallows' Eve on Monday night, I managed to find this cartoon in which Betty Boop throws a Halloween party for all her friends, complete with bobbing for apples. 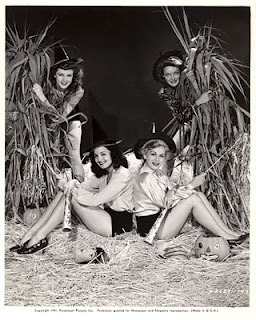 From the Internet Archive, here is the 1933 aimated short, Halloween Party. The Hollywood Revue posted its monthly preview of comming attractions on Turner Classic Movies for the month of November. Apparently, the themes are blond bombshells and ships. If you’re a fan of blonde bombshells, this is the month for you! Rather than having just one star of the month, TCM will be spotlighting two classic blondes every Monday and Wednesday this month. 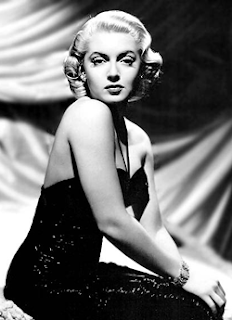 All the classic blondes like Marilyn Monroe, Lana Turner, Jean Harlow, and Jayne Mansfield (just to name a few) will be getting their time to shine. And in preparation for the TCM Classic Film Cruise, they’ll be playing a night of movies set on ships every Thursday. This morning's Sunrise Serenade was "Between The Devil And The Deep Blue Sea" by the Boswell Sisters. Click on the song title to listen courtesy of Jazz On Line. 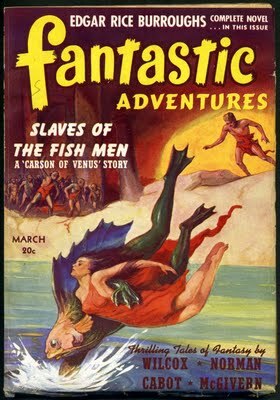 In another great posting of pulp fiction art, Golden Age Comic Book Stories featured a series of covers from Fantastic Adventures. I chose this back cover to illustrate a trend I noticed in this series; namely, most of the aliens appear to be downright cute and apparently friendly. 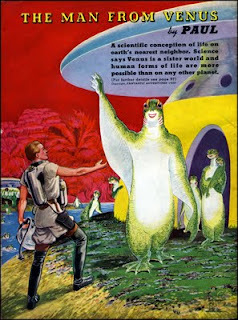 Based on the back covers, our solar system was thought to be populated by a variety of lovable muppet-like creatures. Today's Sunrise Serenade was "Push-ka-pee Shee Pie" by Louis Jordan. Click on the song title to listen courtesy of Jazz On Line. The playlist for the October 26, 2011 broadcast of the Swing Shift Shuffle has just been added to the playlist filing cabinet. During World War II, the manufacturing industry converted almost entirely over to producing goods for the war effort rather than for individual consumers. 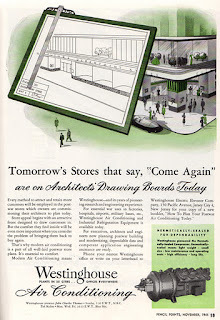 As noted by the Paleofuture blog, however, that did not keep them from advertising what they would be selling after the war; either to the public at large, or in this case, to professionals such as architects who would incorporate the industry's products into post-war infrastructure. This morning's Sunrise Serenade was "I'm Gonna Move To The Outskirts Of Town" by Louis Jordan. Click on the song title to listen courtesy of Jazz On Line. The Red Hot Lindy Hop this Friday night at the Rumba Room features live music by The Side Street Steppers, a vintage costume contest with cash prizes, and a lesson by Jaredan and Erin. 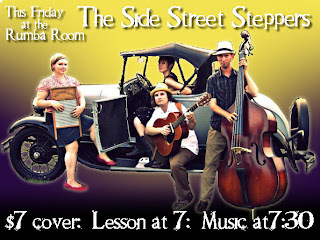 Free lesson is at 7:00 p.m., with a $7 band cover. Dress like you are going out! For a preview of the SSS (nice initials, by the way), check out the video below with some of the RHLH dancers. Today's Sunrise Serenade was "You Broke Your Promise" by Louis Jordan. Click on the song title for a sample from emusic, or click here for the album page. As I have often expressed, I have a weakness for custom made streamliners. I try to exercise restraint in order to prevent the subject from becoming tiresome, but I could not resist this posting on How To Be A Retronaut. 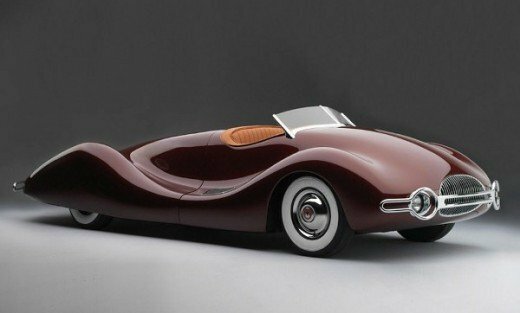 In the 1940's, a mechanical engineer named Norman E. Timbs built this exquisite Buick-based vehicle. This beauty will be going into my fantasy garage next to the 1936 custom Art Deco motorcycle. This morning's Sunrise Serenade was "Barnyard Boogie" by Louis Jordan. Click on the song title to listen courtesy of Jazz On Line. I thought I had seen all of the existing Superman cartoons from the 1940s, but the Internet Archive managed to surprise me once again. In this episode, Lois, Clark and an explorer venture into a vast underground world, which they discover to be inhabited. All I can say is, if Lois did not figure out that Clark was Superman after this episode, her deductive skills are highly questionable. I mean, there was no one else around! From Fleischer Studios in 1943, here is The Underground World. I enjoy these "new devices" articles from the vintage science magazines. The editors describe each of the latest gadgets with equal enthusiasm, without any clue as to which will last or even be produced. For example, in this item from the February 1936 issue of Everyday Science and Mechanics, posted by Modern Mechanix, the new bicycle lamp generator on the upper right of the second page looks just like the one I had on my bike a mere 30 years ago. I guess that design lasted fairly well. This morning's Sunrise Serenade was "Oh, Lady Be Good" by Ella Fitzgerald. Click on the song title to listen courtesy of Jazz On Line. 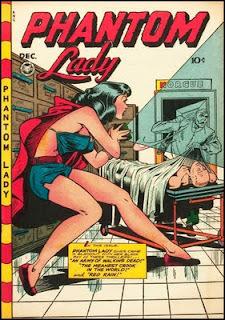 We have not featured any pulp fiction in a while, and Golden Age Comic Book Stories posted another great series of pulp fiction covers from 1940 to 1949. I liked this one from 1941 for the "Slaves of the Fish Men" story with appropriate graphic. This morning's Sunrise Serenade was "Get On Board, Little Children" by Freddie Slack and His Orchestra featuring Ella Mae Morse on vocals. Enjoy the video below from YouTube. The playlist for the October 19, 2011 broadcast of the Swing Shift Shuffle has just been added to the playlist filing cabinet. Thanks to the Hemmings blog for pointing me to this nice bit of automotive/movie history. Remember the old movie scenes when people were riding in a car, with the scenery passing by through the rear and side windows? Well, somebody had to shoot the film of that scenery, and the Internet Archive has it. This footage features an auto tour of downtown Los Angeles and Bunker Hill in the late 1940's. It is great to see all the now "old" cars when they were in their prime. This morning's Sunrise Serenade was "I Ain't Got Nobody" from a V-Disc by Louis Prima and His Orchestra. Enjoy the video below from YouTube. The Red Hot Lindy Hop lesson and session continues this Friday night at the Rumba Room with a lesson by Meghan and Michael Q. and music by Michael Q. Free admission before 7:00 p.m., and $5 at the door afterwards. Next Friday is Live Band Night with The Side Street Steppers, plus a vintage costume contest with cash prizes! Today's Sunrise Serenade was "Swing Low Sweet Chariot" by the Casa Loma Orchestra. Click on the song title for a sample from emusic, or click here for the album page. 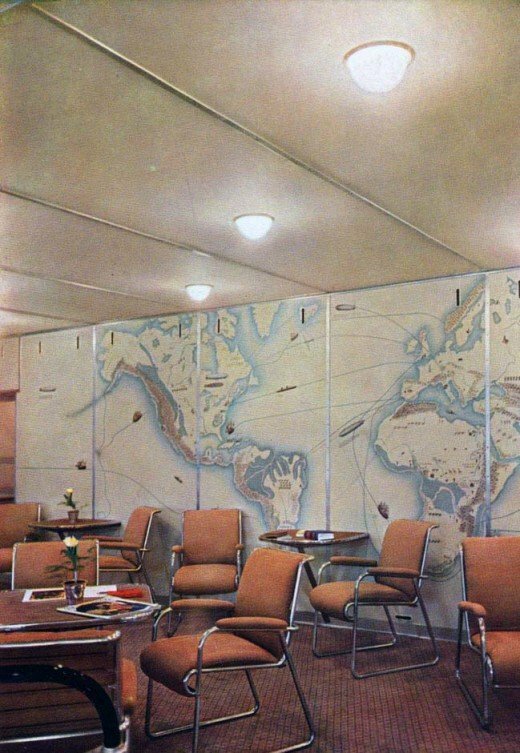 If I had seen this image in isolation, I would have assumed it was a lounge or waiting area at an airport from the 1950's or early 60's. [Insert "wrong answer" buzzing sound here.] This is a lounge on board the airship Hindenburg, built in the 1930's. Granted, the Hindenburg was essentially a German public relations tool, and even without its tragic crash in 1937, dirigibles were too expensive to last long; but it sure had style. How To Be A Retronaut posted it and several other interior color shots from the airship. This morning's Sunrise Serenade was "The Moon Is A Silver Dollar" by Glenn Miller and His Orchestra with (I believe) Marion Hutton on vocals. Click on the song title for a sample from emusic, or click here for the album page. Last Saturday we featured Dangerous Dan McFoo, a 1939 Warner Bros. cartoon directed by Tex Avery. Today, we have a 1945 version of the same story, also directed by Avery, but this time for MGM. It is interesting to note the difference six years and a different studio can make. From the Internet Archive, and starring Droopy, here is The Shooting Of Dan McGoo. 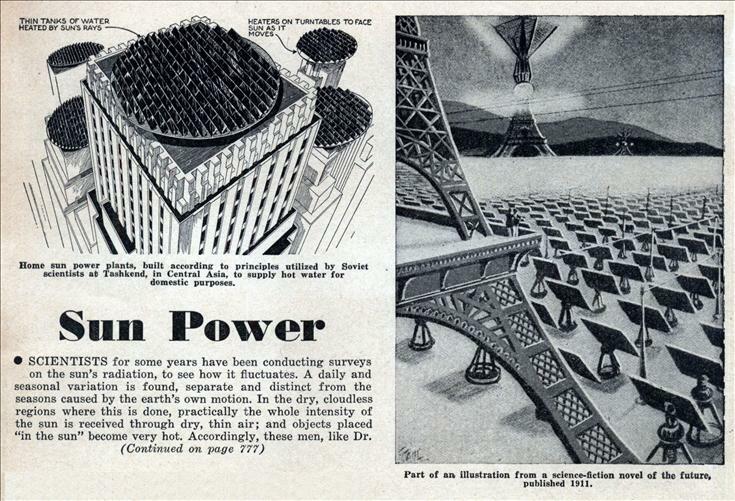 This article about solar power from the 1935 issue of Science & Mechanics, posted on Modern Mechanix, interests me for two reasons. First, it again demonstrates that concepts many consider relatively contemporary have actually been around for a while. 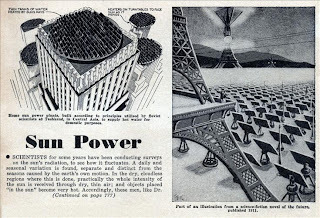 The article discussing harnessing the sun's rays for power is from 1935, and it refers to an earlier work of fiction with the same concept from 1911. The second point is that, unlike many of the advances science fiction promised us in the past (where is my flying car? ), we are actually ahead of the curve on this one. The 1911 novel, set in the year 2660, included a field of sun-power devices, rotating to face the sun. While we have not put such an array in front of the Eiffel Tower as in the illustration, that technology exists today, a good 600 years ahead of predictions. This morning's Sunrise Serenade was "Wood And Ivory" by Ambrose and His Orchestra. Click on the song title for a sample from emusic, or click here for the album page. used a "black light projector," a device which allowed her to blind her enemies and make herself invisible. She drove a car whose headlights also projected black light when necessary. She was sometimes assisted by her fiance, Donald Borden, an agent of the U.S. State Department. Today's Sunrise Serenade was "Streamline Strut" by Ambrose and His Orchestra. Click on the song title for a sample from emusic, or click here for the album page. The playlist for the October 12, 2011 broadcast of the Swing Shift Shuffle has just been added to the playlist filing cabinet. I have been following the neat history site How To Be A Retronaut for some time, and reposting items from it to this blog on a regular basis. After I finished my series of antique Memphis postcards, it occured to me that the cards would be a neat "time capsule" on that site, so I sent in the scans. I was flattered to see that HTBAR posted the entire set today. So if you missed them here, or you want to see them all at once, check out "Colourised Postcards of Memphis 'The Cotton Carnival City.'" This morning's Sunrise Serenade was "Ciribiribin" by Harry James and His Orchestra. Click on the song title to listen courtesy of Jazz On Line. The weekly Red Hot Lindy Hop lesson and session continues this Friday night at the Rumba Room with a lesson by Mike T. & Michelle and music by Bethany. Free admission before 7:00 p.m., and $5 at the door afterwards. Today's Sunrise Serenade was "I Saw Stars" by Django Reinhardt and the Hot Club Quintet of France. Click on the song title to listen courtesy of Jazz On Line. Now this is some serious seagoing style. Dieselpunk posted this item about Anthony Fokker's (of German aircraft fame) streamlined yacht, the Q.E.D. An item in Time magazine from October 16, 1939 described the fate of the vessel. The 70-ton, 26-knot motor yacht Q. E. D., streamlined startler designed by and built for Dutch Airman Anthony Herman Gerard Fokker in his slickest airflow style, sank in the Hudson River near Yonkers, N. Y. Honeymooning on the borrowed boat were a bride and groom of five hours, friends of Fokker, when a fire started in an ornamental fireplace in an after cabin, spread quickly, driving honeymooners and crew overboard. At the launching a year ago, Designer Fokker mused: "I hope it will be obsolete within two years. . . . That is good. That is progress. Today there are too many yachts that outlive their owners. . . ."
This morning's Sunrise Serenade was "Eadie Was A Lady" by Cab Calloway and His Orchestra. Enjoy the YouTube video below. I found two cartoons directed by Tex Avery with the same subject, but produced at different times and for different studios. The comparison is interesting. Today we have the 1939 version made by Warner Bros. From the Internet Archive, here is Dangerous Dan McFoo. This copy has subtitles in French. Watch for Betty Davis to show up around 2:40 (seriously!). In another vivid set of photographs, How To Be A Retronaut reveals the color of New York in the 1940's. The photo below shows a street in lower Manhattan. This morning's Sunrise Serenade was the vocal version of the Hawaiian War Chant, often done by Tommy Dorsey as an instrumental: "Ta-hu-wa-hu-wai" by the Merry Macs. Click on the song title to listen courtesy of Jazz On Line. First Ever WEVL Trivia Tournament! 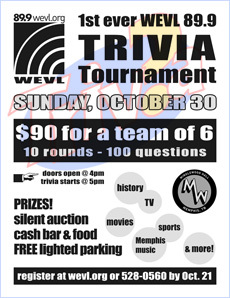 As you know, the Swing Shift Shuffle would not exist without WEVL, so check out the first ever WEVL Trivia Tournament on Sunday, October 30 at Minglewood Hall. In addition to the prizes for the trivia contest, there will also be a cash bar, food, and a silent auction. Registration is necessary to participate, and the deadline is October 21, so get your team together and enter! Today's Sunrise Serenade was "One O'Clock Jump" by Count Basie and His Orchestra. Click on the song title to listen courtesy of Jazz On Line. The playlist for the October 5, 2011 broadcast of the Swing Shift Shuffle has just been added to the playlist filing cabinet. First Drive Through Bank Window? 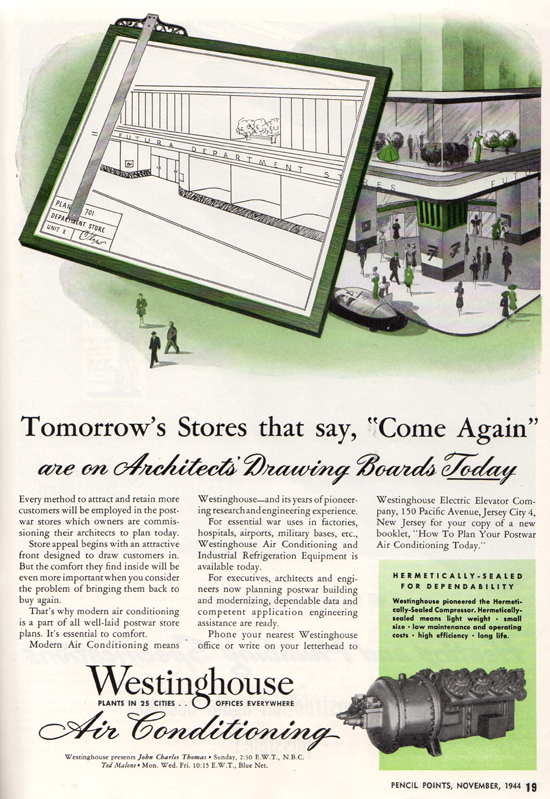 I do not know if the subject of this item from the September 1938 issue of Modern Mechanix, posted on Modern Mechanix, was the first drive through bank service, but the article certainly suggests it was a new concept. This morning's Sunrise Serenade was the Mills Brothers' version of "Smoke Rings." Click on the song title to listen courtesy of Jazz On Line. 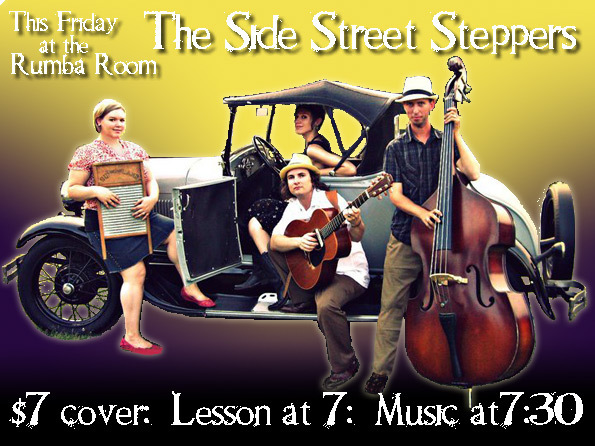 The Red Hot Lindy Hop features live music from Jeremy Shrader's New Memphis Hepcats this Friday night at the Rumba Room, along with a lesson by Amanda and Kirk. Free admission before 7:00 p.m., and $7 at the door afterwards. The New Memphis Hepcats, a 16-piece swing outfit led by vocalist and trumpeter Jeremy Shrader, have just announced a performance at the Rumba Room in Memphis, TN on October 7. Performance time is set for 7:30 - 9:30, following free swing dance lessons at 7, tickets are $7 and may be purchased at the door. The ‘Hepcats’ began in 1997 as an ensemble dedicated to the performance and preservation of vintage swing music from the 1920s-60s. The band has also featured compositions from its members and affiliates, many alumni of the University of Memphis jazz program. Now in it’s 14th year of existence, the band performs primarily at private events in the Memphis area and have traveled to Little Rock, Washington, D.C., Knoxville, Columbia, SC, and St. Louis. 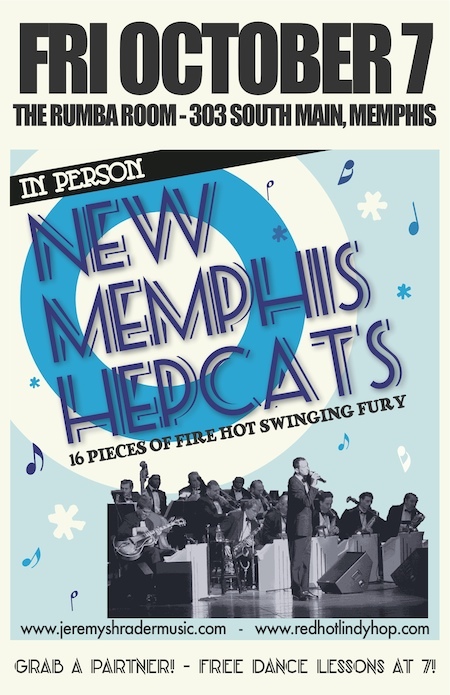 The New Memphis Hepcats have also released two CDs, 1999’s ‘Live at the Hi Tone’ – where the band spent over two years as a regular fixture on Monday nights at the Memphis nightclub, and ‘Swingopoly’ – released in 2003. Today's Sunrise Serenade was "Put On Your Old Grey Bonnet" by the Mills Brothers. Click on the song title to listen courtesy of Jazz On Line. Matinee At The Bijou posted an excellent article about the "screen songs" that encouraged audience participation at the theaters by using the bouncing ball over the lyrics. Think of it as early mass karaoke. Audience sing-alongs to words projected on a screen go back before 1900 -- when magic lanterns were used in vaudeville shows. The famous "Bouncing Ball" debuted in 1924 in the Max Fleischer Ko-Ko Song Car-Tune Oh Mabel. Matinee posted this example from 1945 called, When G.I. Johnny Comes Home. The sing along starts out as the standard version of "When Johnny Comes Marching Home," but it gets a bit hip and swinging toward the end. This morning's Sunrise Serenade was "Diga Diga Doo" by the Mills Brothers with Duke Ellington and His Orchestra. Click on the song title to listen courtesy of Jazz On Line. We take another page from the nursery rhyme book this weekend with this 1935 animated short from Ub Iwerks. From the INternet Archive, here is Old Mother Hubbard.